"A haunting and mesmerizing story about sisterhood, family, love, and loss by literary luminary Edwidge Danticat. Giselle Boyer and her identical twin, Isabelle, are as close as sisters can be, even as their family seems to be unraveling. Then the Boyers have a tragic encounter that will shatter everyone's world forever. Giselle wakes up in the hospital, injured and unable to speak or move. Trapped in the prison of her own body, Giselle must revisit her past in order to understand how the people closest to her--her friends, her parents, and above all, Isabelle, her twin--have shaped and defined her. Will she allow her love for her family and friends to lead her to recovery? Or will she remain lost in a spiral of longing and regret? 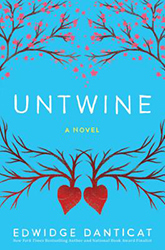 Untwine is a spellbinding tale, lyrical and filled with love, mystery, humor, and heartbreak.